How to make a stunning apple tart with a buttery crust, thinly sliced apples, and toasted almonds. Jump to the Simple Apple Tart Recipe or read on to see our tips for making it. 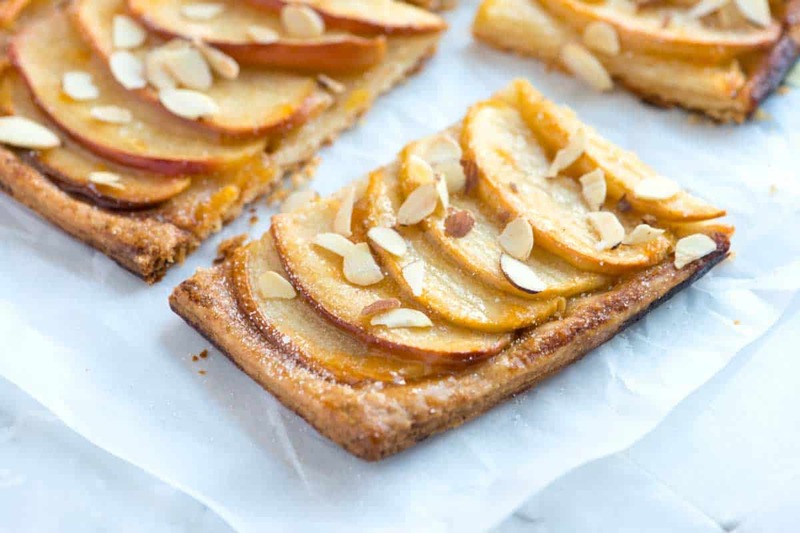 This apple tart looks like it came from a fancy bakery, but it’s easily made at home. We’d even say it’s a little easier than making apple pie. 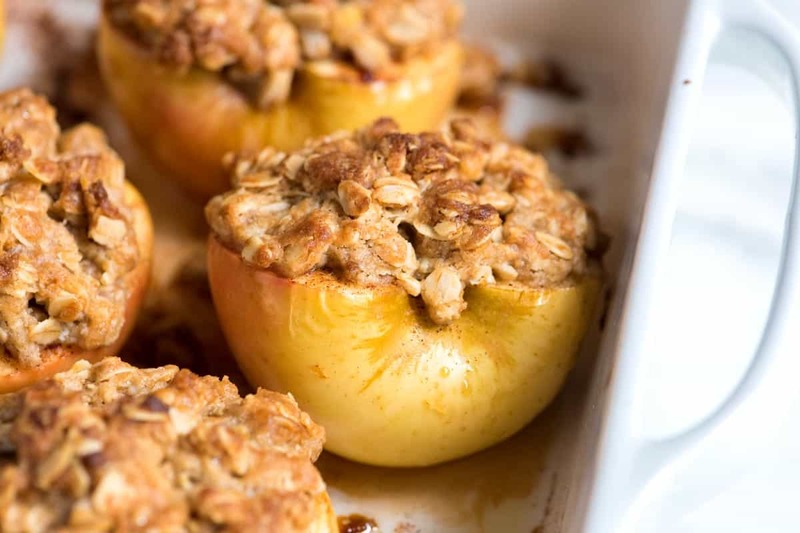 YOU MAY ALSO LIKE: This baked apples recipe is easy enough for tonight, but doubles as the perfect dessert for friends and family (or the holidays). These just might beat apple pie! Jump to the Baked Apples Recipe. There’s nothing fussy, here. Just thinly sliced apples lined up on top of a buttery, flaky crust. 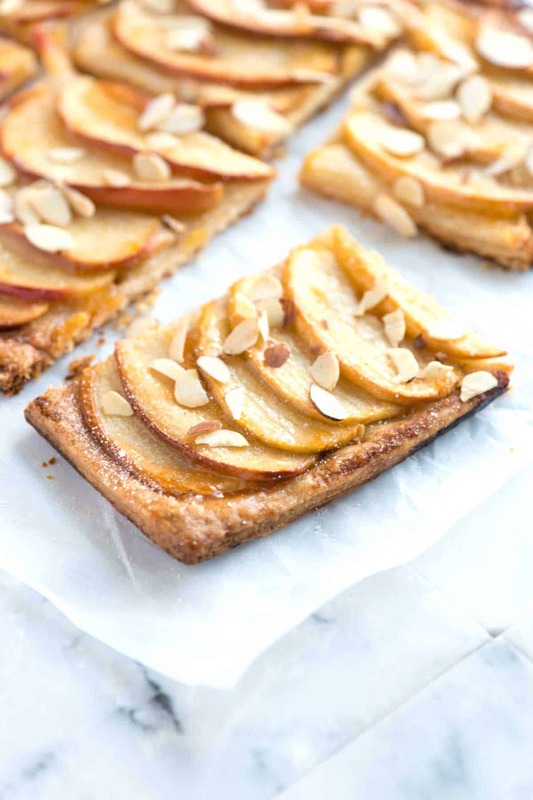 The apples are lightly brushed with apricot jam then topped with a handful of sliced almonds. We love it just the way it is, but you could very easily skip the jam and go for a drizzle of caramel sauce instead. A dusting of powdered sugar is also nice. We make our own flaky crust, but a sheet of store-bought puff pastry is an excellent alternative. 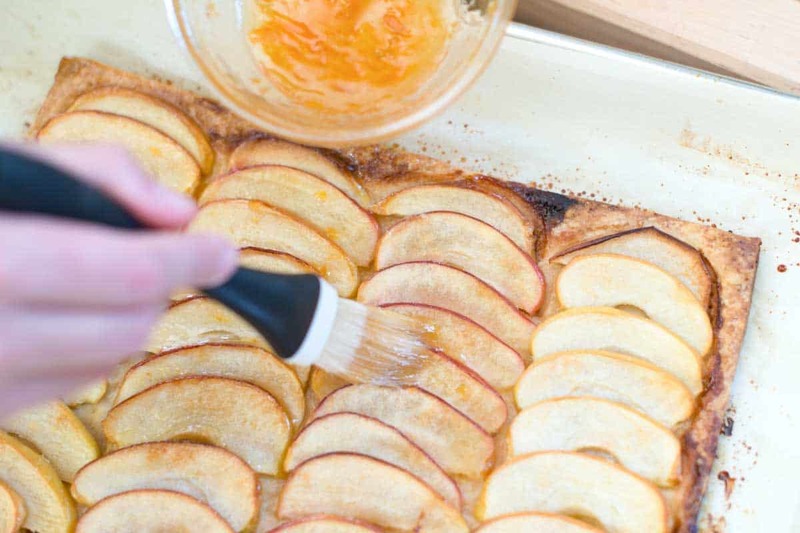 See our notes in the recipe below for how to make this apple tart using puff pastry. Any baking apple will work — you’ll need two. We used Braeburn apples. We just love the rosy peel around the edges. Granny Smith is also a good standby. You can even use pears or a combination of apples and pears. That would be delightful. 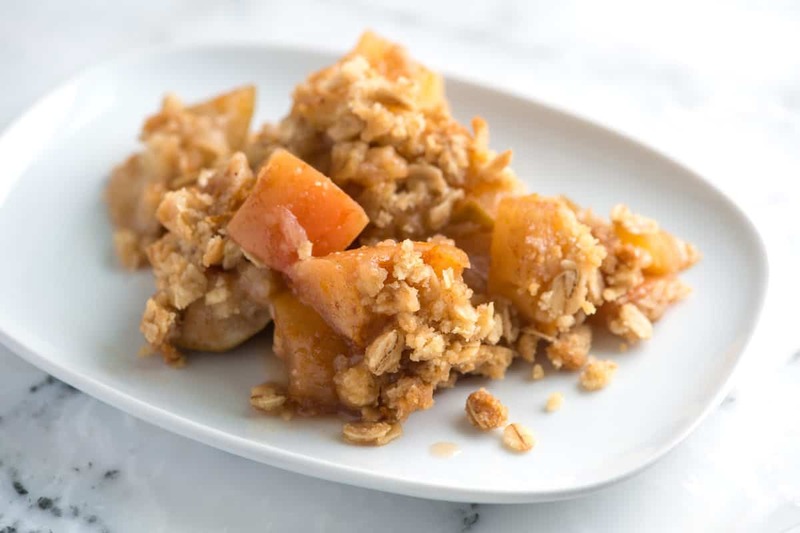 YOU MAY ALSO LIKE: This apple crisp recipe with oats has sweet tender apples and a crisp and crunchy topping made with flour, oats, brown sugar, butter, and cinnamon. Jump to the full Apple Crisp Recipe. Disclosure: We’re sharing this in partnership with Gold Medal Flour. This recipe was part of an ongoing relationship with Gold Medal. We have also shared our vanilla peach muffins, a spin on our already popular blueberry muffins. This simple tart is best served warm. We love it alone, but it certainly does not hurt to add a scoop of vanilla ice cream or whipped cream. Much of the time required for this comes from the crust. To make things easier, make it ahead of time. The crust can be made and refrigerated up 2 days in advance. Or substitute this homemade crust with a sheet of store-bought puff pastry — see our notes for how to do this below. Add 3/4 cups of the flour, salt, and the sugar to the bowl of a food processor fitted with the steal blade. (See note below for making crust by hand). Pulse 2 to 3 times until combined. 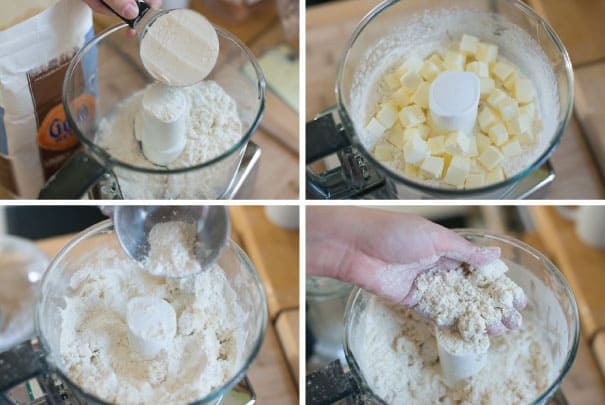 Scatter butter cubes over flour mixture and process until a dough or paste begins to form, 15 to 20 seconds. (There should be no uncoated flour). Scrape bowl, redistribute the flour-butter mixture then add the remaining 1/2 cup of flour. Pulse 4 to 5 times until the flour is evenly distributed. (Dough should look broken up and crumbly). Transfer the dough to a bowl and scatter with 3 tablespoons of the water. Using a rubber spatula, press the dough into itself. The crumbs should begin to form larger clusters. If you pinch some of the dough and it holds together, it’s ready. If the dough falls apart, add 1 to 2 tablespoons of extra water and continue to press until the dough holds together. Transfer to a clean surface. Work the dough just enough that it comes together into a ball. Shape into a flat rectangle then wrap with plastic wrap. Refrigerate at least 30 minutes and up to 2 days. Adjust an oven rack to the middle position and heat oven to 400 degrees F. Line a large baking sheet with parchment paper. Roll chilled dough into a 13-by-9-inch rectangle. Trim edges then transfer to the baking sheet. Using a fork, prick the crust every 1/2-inch to prevent air pockets from forming while it bakes. Refrigerate while you prepare the apples. Cut apples in half through the stem. Remove stems and core them (a melon baller helps, here). Slice the apples crosswise into 1/2-inch-thick slices. Scatter lemon juice over apples to prevent browning. Place overlapping slices of the apples in four rows down the tart; 8 to 9 slices per slice should do it. To keep things pretty, it’s best not to use the smaller slices from the ends of the apples). Scatter sugar over apples and dot with butter. Bake for 40 to 50 minutes, until the crust is browned and the edges of the apples begin to brown. Rotate once during baking. Don’t worry if juices from the apples run out onto the pan and brown. The tart will still be okay. When the tart is done, use a large spatula to loosen then transfer to a cutting board or platter. 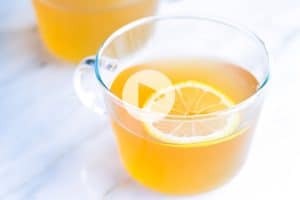 Warm the jam on the stove or using a microwave. Lightly brush warmed jam over the apples. Scatter almonds on top. Make the crust by hand: Take a look at our pie crust recipe and article. 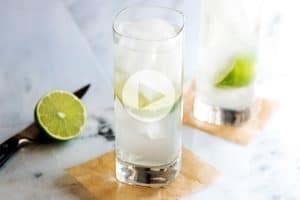 There, you will find our tips and a video showing how we make it using a food processor as well as how we make it by hand. Instead of glazing the tart with jam, try adding a drizzle of caramel sauce or dust with powdered sugar. To toast almonds, add to a dry pan over medium-low heat. Shake the pan constantly to prevent burning. The nuts are toasted when they’re lightly browned and smell nutty. How to make an apple tart using puff pastry: Unfold a sheet of puff pastry onto a floured surface and roll out into a 13-by-9-inch rectangle. Transfer to the baking sheet. Score 1/2 inch in from the edge, all the way around, using a paring knife. Using a fork, prick the crust every 1/2-inch to prevent air pockets from forming while it bakes. Continue with adding apples to the crust as shared in recipe above. Hi there, making this in a tart shell would work nicely. Frankly speaking, I have never tried apple tarts before, but I suspect they taste almost like apple pie (which I adore). 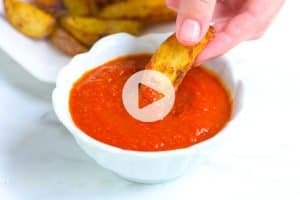 Thanks for the recipe, seems like it’s really easy to make them. I tried this today and it was superb! Only comment is that, 400 F for 45 minutes is an overkill…375 for 45 should be better. I made this tart at my sisters house this weekend it was super easy and super scrumptious. I topped it with a little vanilla ice cream and some cinnamon because I love sweets. 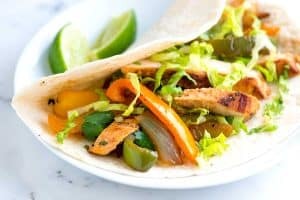 Great recipe, tried twice already, so good. Wondering how can I use this recipe to make pale turnover? Hi Esther, Great question. The crust is regular pie dough, so you should be able to roll it out and cut into large circles or rectangles to make turnovers. We’re not quite sure about the filling, though. You might want to mix the apples (maybe chopped, not sliced) with sugar and a little lemon juice then add them to the dough. Hope that helps! I actually made a version of this using Ina’s recipe about an hour ago. I used frozen puff pastry and pear jelly. It turned out great. This looks simply spectacular! I love the idea of making it with apples and pears! Mmm this sounds super scrumptious!